Slotland Software was established in 1998 and they are well known for their exclusive games - you can't play any of Slotland's casino games anywhere else but at the Slotland Casino. For any players in the US who are struggling to find a decent casino where they can play video poker - casinos powered by Microgaming, for example, being unable to accept US players at the moment - on their mobile or tablet, Slotland is a great solution offering as they do Jacks or Better to play as well as a selection of casino games and slots games too. As is typical with all casino software providers at the moment, Slotland's portfolio of games to play on mobile devices is much less than what they have to offer in their standard online casino version however with the recent explosion in popularity of mobile gaming we're pretty sure this will change in the future and we'll see more choice including, we hope, a bigger selection of video pokers. Slotland Software's mobile video poker is a fast, easy and convenient way to play video poker and with Slotland Software working hard to increase their portfolio of mobile casino games we're confident that the number of video pokers for mobile that they have to offer is soon going to increase. 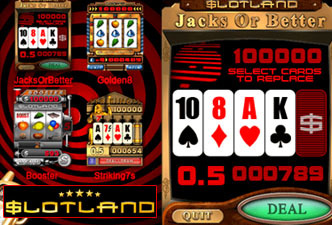 As previously mentioned, Jacks or Better video poker is the game on offer in the Slotland software suite and it's available to play on a wide range of devices - Slotland Software is fully compatible with the latest iPhones and iPads plus Andoid devices and older WAP phones. You can play games using any cell phone, mobile phone, Smart phone or PDA (Personal Digital Assistant), which supports Java technology, and with a color display having a minimum resolution of 128x128 pixels. To play the mobile Slotland video poker Jacks or Better game you'll first need to register an account then download and install the game; the exact steps you need to take vary depending on your phone model but full phone specific instructions are supplied on the Slotland Casino website . Games are downloaded to a folder called 'Games', Java', or 'Other applications' depending on your set up, and after a few seconds downloading is complete and the game will be automatically be installed and you can start playing. Slotland's mobile video poker game is very easy to play either if you're used to playng video pokers online or a total newbie - the game can be picked up in seconds. •Step 1: Determine the size of your bet. The bet ranges from $0.5 to $10. You can change the bet by using the up and down arrows of the navigation cross on a phone, or by pressing the numbers 1 to 5. •Step 3: When the cards are dealt you can select the cards to discard with the left and right navigation keys. Discard the card by pressing the middle button. If your phone doesn't have the middle button just use the up and down keys to flip the card or you can use the numbers 1 to 5 to select and discard the cards (if you change your mind, just press the same button again and the card return). Press the 'Draw' button or number 6 key again. •Step 4: Once you are dealt the remaining cards, you can see the final hand. If you win, a flashing sign with the winning combination and amount appears. Tip: In order to win the Slotland progressive jackpot, you need to place the maximum bet of $10 and get the Royal Flush winning combination. Fancy trying your luck with Slotland Mobile Video Poker game? Slotland Mobile are offering all new players a $1000 Free Welcome bonus plus entry to a Weekly Draw Bonus, Cashback Bonuses and VIP Club. Visit Slotland Casino now and register an account to have instant access to their online video pokers plus download Jacks or Better for mobile and play anytime, anywhere. You may also be interested in our guide to Playtech mobile Software Video Poker and Microgaming mobile Software Video Poker (neither are currently suitable for US players).